What is the history of eyeglasses? When did glasses start being used for vision correction? Who invented glasses? No one knows the name of the inventor of magnification, but between 1000 and 1250 AD, reading stones appeared — spherical magnifying glasses you could lay over your manuscript to enlarge letters as you read. According to Antique Spectacles, though Greek and Arabic scholars had described the idea of convex (or converging) lenses, it was a thirteenth-century English Friar, Roger Bacon (one of the founders of modern science), who confirmed the idea with experiments. Bacon experimented with lenses and mirrors and recorded his observations about reflection and refraction. The first pair of what we would consider eyeglasses appeared in the late 1200s in Pisa, Italy. These eyeglasses actually looked like two small magnifying glasses (made with convex-shaped glass) riveted together at the top of their handles. We do not know the name of the individual who came up with this idea, perhaps because he wanted to keep it secret to profit from it. However, two monks in Italy hailed the new invention of eyeglasses a few decades later. Antique Spectacles provides this quotation from the earliest primary source, the monks Giordano da Rivalto and Alessandro della Spina: "On Feb. 23, 1306, Giordano mentioned them by stating in a sermon ‘it is not yet twenty years since there was found the art of making eyeglasses which make for good vision, one of the best arts and most necessary that the world has.' He coined the word ‘Occhiale' [eyeglasses]." The Museum of Vision notes that early eyeglasses were mostly used by monks and scholars. Instead of having temples that went behind your ears, these spectacles were held in front of your eyes or balanced on your nose. The exclusivity of eyeglasses changed after the invention of the printing press by Johann Gutenberg in 1452. Not only did that monumental invention open up reading to the general public, but it also brought about a rise in the need for eyeglasses, which led to the first "mass production of inexpensive spectacles." The demand for eyeglasses increased again with the start of the first newspaper, the London Gazette, in 1665. By the 1800s eyeglasses abounded, but not as we think of them today. You didn't have lenses custom made; rather, you went to a jeweler, hardware store, or met with a traveling peddler to try on different pairs of eyeglasses until you found one that worked. The Museum of Science notes, "Eyeglasses were considered evidence of old age and infirmity." So instead of wearing eyeglasses all the time, people often opted for handheld devices such as lorgnettes (spectacles with a single handle on one side) or scissor spectacles (where lenses moved on a hinge). Scissor spectacles and lorgnettes were popular in France. Although we may associate the flourishing of these types of eyeglasses with the aristocracy, it was actually the French revolutionaries who used them the most. According to the United Kingdom institute The College of Optometrists, "Napoleon Bonaparte used a pair to correct his myopia." The next popular style of glasses was the "pince-nez." These were inexpensive spectacles that perched on the bridge of your nose. Not surprisingly, they were uncomfortable and easy to lose. By 1890, spectacles also moved into the realm of fashion: "Fan spectacles were designed for ladies of elegance to use as a multifunctional accessory." The sides, or temples, that we associate with modern eyeglasses came late in the history. After various inventors took stabs at ways to better attach spectacles â€" such as an over-the-head, under-the-bonnet crown, or eyewear that attaches to a capâ€"it wasn't until about 1727 that spectacles became eyeglasses with the introduction of sides. In London, Edward Scarlett, optician to His Majesty George II, was the first to advertise eyeglasses with sides. These kind of glasses became known as the "Scarlett-type." In this case, the sides ended in a flat spiral (later replaced by rings), which were designed to rest against the head, not go behind the ear as eyeglasses typically do today. For once, you could easily take eyeglasses on or off, and yet they didn't interfere with your hair or your wig. From there, the invention of different forms of temples took off. Double-joined temples folded back on themselves to provide more comfort, and turn-pin sides were long and curved around your head almost completely. In the mid 1850s curl sides were invented, which were curling wires that went behind your ears. Curl-side frames were especially common as children's eyeglasses because they stayed in place while running or playing. 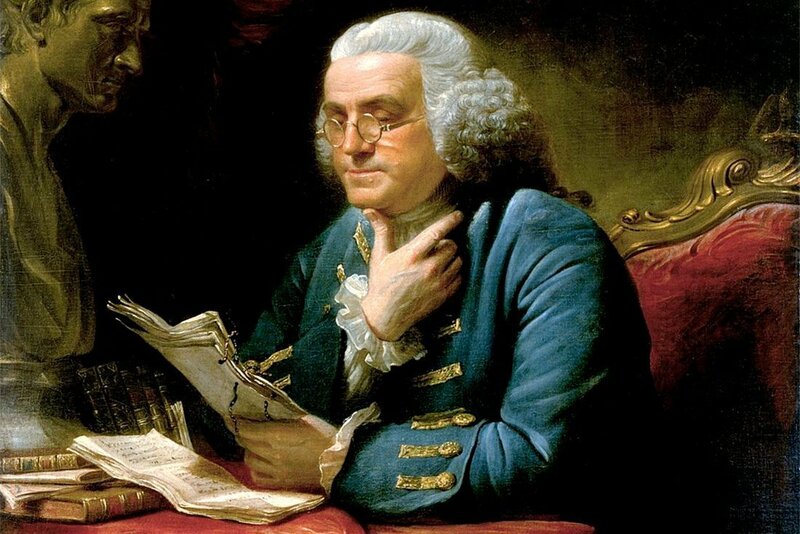 The American renaissance man Benjamin Franklin is credited with inventing bifocals in the mid 1700s. He split one lens in half, with the upper part being made for distance viewing and the lower part for near viewing. Antique Spectacles notes that Franklin wrote to London philanthropist George Whatley in May 1785, "As I wear my own glasses constantly, I have only to move my eyes up or down, as I want to see distinctly far or near, the proper glasses being always ready." By the end of the 18th century, Philadelphia store proprietor John McAllister opened the first optical shop in America. When the War of 1812 and the trade embargo with Great Britain hindered his importing ability, he began making his own frames out of gold and silver. He and his son also imported the first cylindrical lenses for astigmatism. Antique Spectacles calls him "the founder of the profession of opticianary in this country." Today, in the 21st century, you can find thousands of styles of eyeglasses in all shapes, sizes, and colors. You can even order eyeglasses online by visiting a retailer like FramesDirect.com. The inventors of the past have created a product that is more than popular: Today, the Vision Council estimates there are over 149 million adult eyeglass wearers in the United States (more than half of U.S. adults).